When I received a mail from IndusLadies Partners asking my interest to participate in their contest event Kids Lunch Box Recipes, I replied them back about my willingness and send them list of few dishes. The first dish was Stuffed Appos, and you can check the recipe posted here. 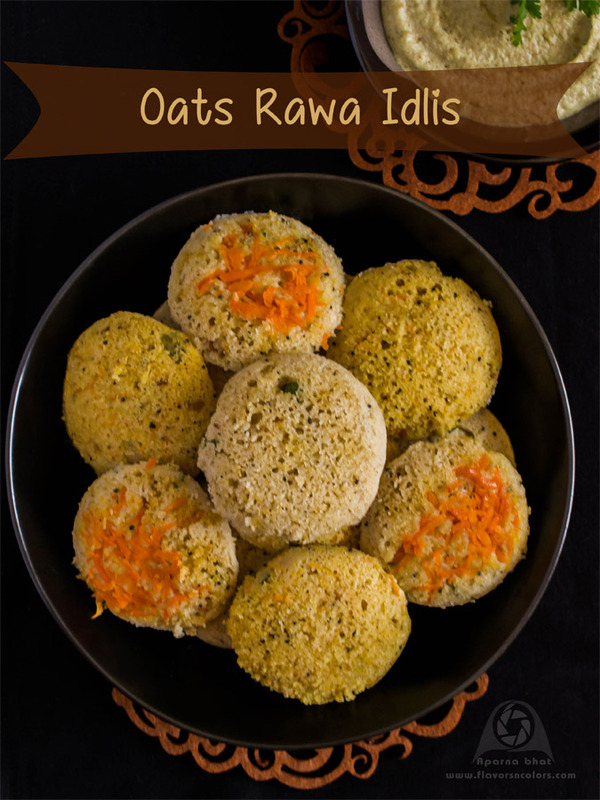 Today it's "Oats Rawa Idli". 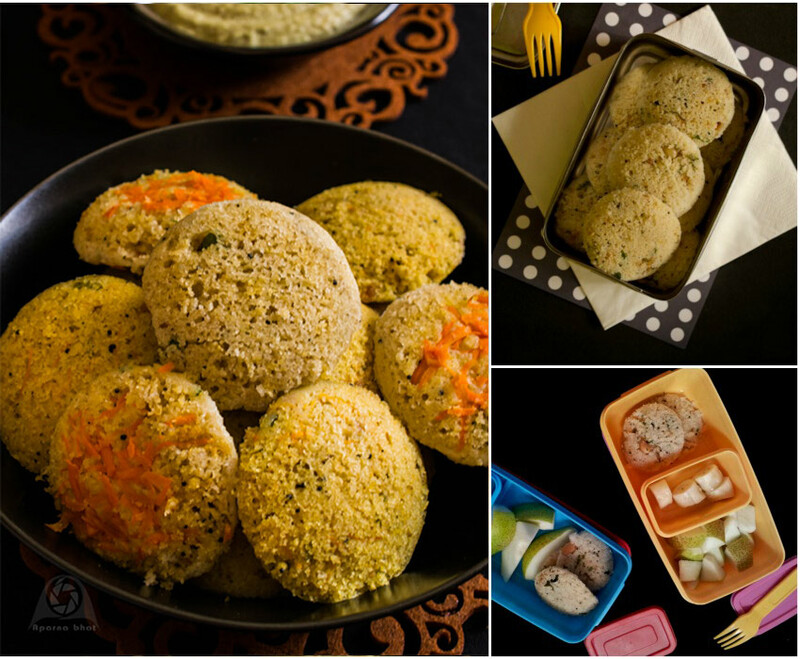 The idea of using oats in making idlis was inspired by many fellow foodies across food groups on social websites. There were variations seen across the recipes such as proportion of rawa to oats powder being 1:1, 1/2: 1 or 2:1. I decided to go with 1:1 proportion and rest of the ingredients were used as per availability. You can use different veggie combinations. Here you see use of grated carrots. You may mix the grated carrots directly into the batter [mind it this tends to change the color of idlis] or place the grated carrots first in the greased moulds topped by batter [see the below pic where you see few idlis been decorated with grated carrots on top]. I sometimes dont add carrots at all and place roasted cashews in the moulds before pouring the batter. Let's see the recipe below. Pour water for steaming in steamer or pressure cooker. As the water starts boiling in it, reduce the flame. Next prepare seasoning in a small pan. Heat ghee and add mustard seeds. Let it splutter add urad dal, cashews and saute it till urad dal as well as cashews begin to turn brownish. Next add finely chopped chillies and curry leaves. Add asafoetida and switch off the flame. Pour this seasoning on the oats rawa mixture. Add salt, pinch of sugar, grated carrot [optional], finely chopped coriander leaves. Soda and buttermilk [or curds +water mixture] goes last in to the mixture, just before steaming. You may add few tsps of water to get proper consistency of batter [ neither runny nor thick]. Pour the batter into the moulds. Steam it for 12-15 mins or until done like you would do with regular idli batter. Serve it warm with chutney or any choice of accompaniment.